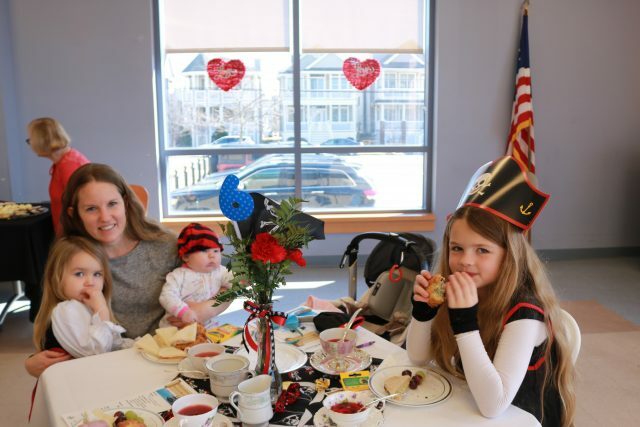 Adrienne Neal, of Ocean City, and her daughters, Gloria, 3, Amelia, 3 months, and Sophia, 7, enjoy "Children's Tea." 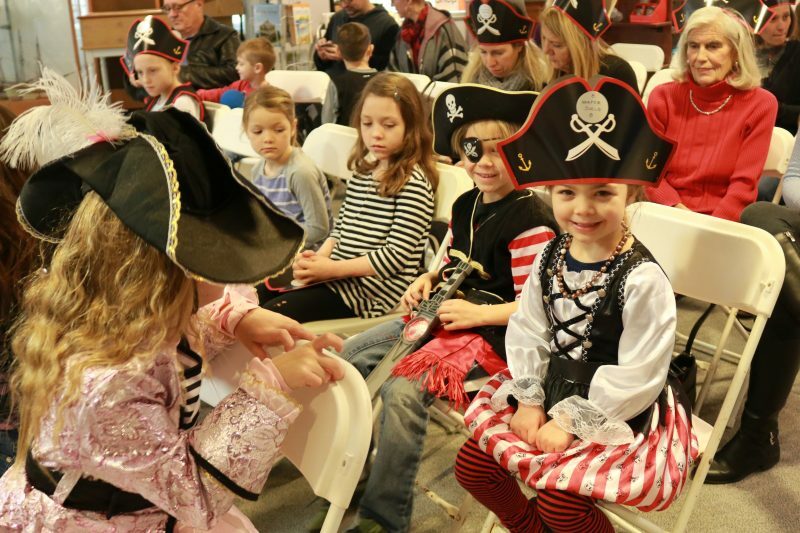 Pirates and scallywags made their way to the Ocean City Historical Museum on Saturday for well, tea and sandwiches, not buried treasure. But before tea and finger sandwiches were served came entertainment and a bit of history, by way of Babs Stefano and Paul Anselm, dressed in costume. The two museum members put on a program that entertained children of all ages who filled the room. Stefano made an exciting entrance. She stormed in the room in pirate attire waving a plastic sword. “I am not a scallywag!” shouted Stefano, to the sounds of chuckling children. The Juelg family arrived right on time. Gunner Juelg, 7, of Ocean City, and his sister, Harper, 4, were decked out in their fierce pirate costumes. Harper Juelg, 4, of Ocean City, and her brother, Gunner, 7, enjoy the show. Stefano explained some pirate history and fun facts and interacted with the children, asking them if they knew about pirates. The children clapped, laughed and smiled, especially when Stefano spoke about some of the different pirates. 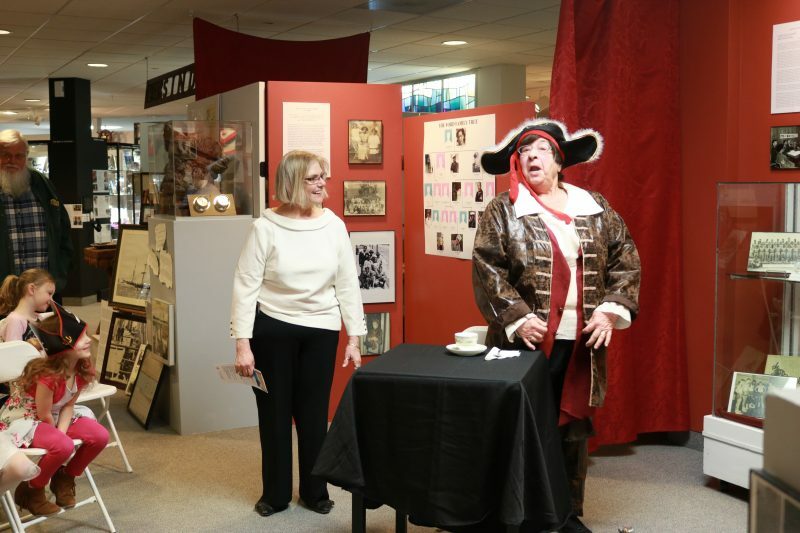 At one point, just before tea, Carol Dotts, a member of the museum and chairwoman of the event, joined with Stefano to amuse the children with a vignette. Dotts jokingly showed Stefano, a “scallywag,” the proper etiquette she must follow to be able to join in tea. Very important rules included napkin and spoon placement and how to properly hold the teacup. Chairwoman of the event, Carol Dotts, a museum board member, teaches Babs Stefano, also a board member, how to sit and drink tea in an amusing skit. 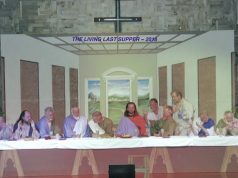 After the show in the museum, the children and their families made their way to the Stainton Senior Center for raspberry and orange tea, punch, sweets such as scones and cupcakes, grapes, hummus and cucumber sandwiches and chicken salad sandwiches. Sophia Neal, 7, of Ocean City, happily wore her pirate hat. She and her sister, Gloria, 3, watched the show with their mother, Adrienne Neal. “We come every year,” Adrienne Neal said. Sophia was sure about her favorite part. “I like the scones,” she said of tea time. To that, her mom laughed. Gloria wasn’t quite sure what she liked most, except her mom had an idea. “She is hungry,” Neal said with a chuckle. 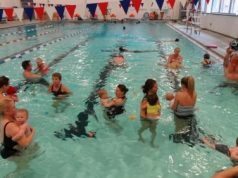 Mark Moffitt, of Ocean City, and his wife, Patricia, called the program cute and entertaining. Their son, Jason Moffitt, brought along his sons, Connor, 7, and Ethan, 3. 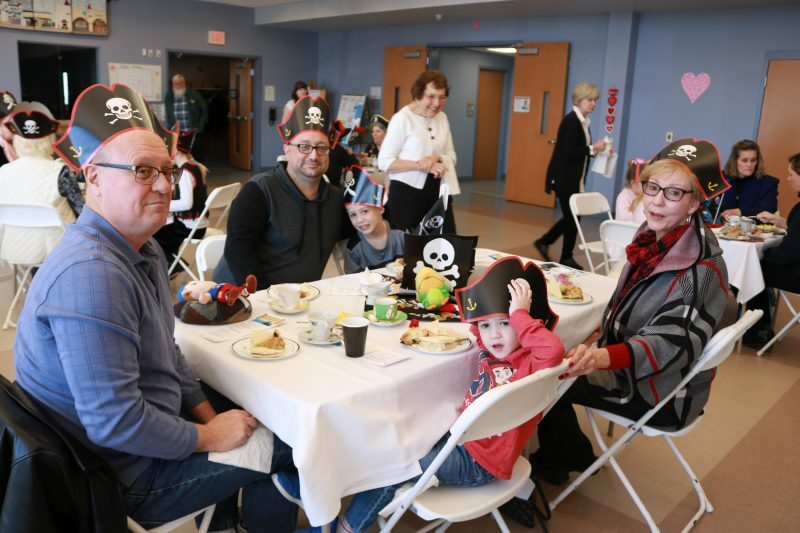 The Moffitt family enjoy tea and finger foods after the pirate presentation. 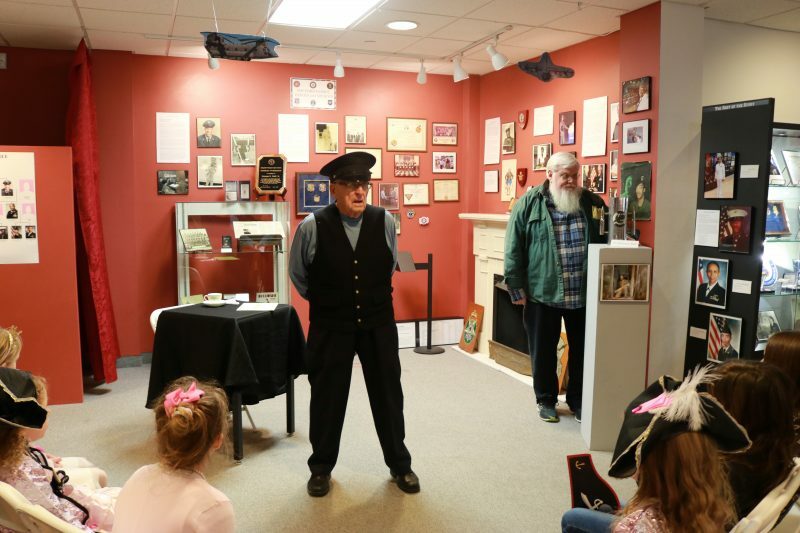 Dotts called it an important way to showcase children’s events in the museum. 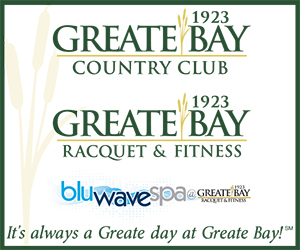 The Colony Club sponsored the event. 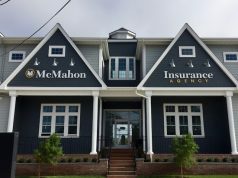 Other organizations that contributed included Acme Supermarket, Patti’s Party World in Cape May Court House, St. Peter’s United Methodist Church and Barefoot Market. 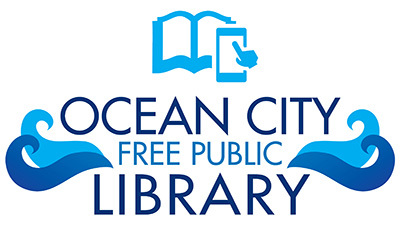 To learn more about the Ocean City Historical Museum call 609-399-1801 or visit www.ocnjmuseum.org or on Facebook.